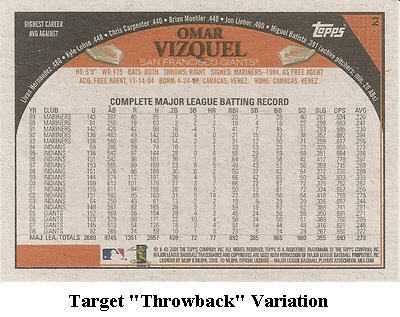 Both Walmart and Target released retail exclusive limited edition variation sets of 2009 Topps Baseball. The variations mirrored the entire base set of the main release. Blaster Boxes of Walmart's exclusive "Black" 2009 Topps Series 1 Baseball variation cards were marked with the code 1-825-50-13-9. The code can be found on the outer packaging, directly above the bar code. 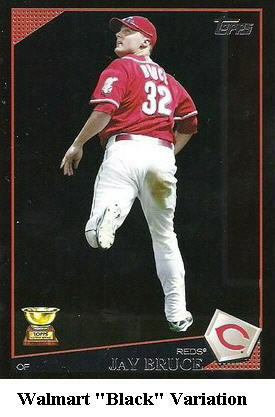 Target sells the other exclusive 2009 Topps Series 1 Baseball variation set. 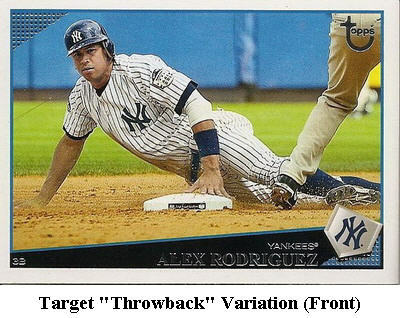 Their "Throwback" variation set features gray backed cardboard stock and Topps' old logo. Blaster Boxes of Target's exclusive 2009 Topps Series 1 Baseball variations can be identified with the component code 1-825-50-12-9. identifiable component code found directly on top of the bar code.